HA NOI (VNS) — The VN-Index on the southern bourse managed to exceed the 580-point level yesterday, adding 3.94 points, or 0.68 per cent, to end at 583.69 points. The gains were mainly registered by blue chip companies, such as Vinamilk (VNM), real estate giant Vingroup (VIC), Vietcombank (VCB), and Masan Group (MSN). Bao Viet Group (BVH) also gained and speculative stocks were also active yesterday. Tracking the 30 largest stocks by capitalisation and liquidity, the VN30-Index advanced 0.67 per cent to end at 655.8 points with gainers overwhelming losers by 17-7. Yesterday, the government agreed that the Kien Luong Thermoelectric Project of the Tan Tao Energy Joint Stock Company should be shifted from build-own-operate to build-operate-transfer practice. This decision means that the Tan Tao Group (ITA) will continue to implement the US$6.7-billion project. Shares of the Tan Tao Group (ITA) soared 5.7 per cent to its ceiling price of VND8,700 ($0.4) per share yesterday and nearly 19 million shares were traded. The Bao Viet Group (BVH), Masan Group (MSN), and Vinamilk (VNM) added VND1,000 ($0.047) per share. Losers included big names, such as PetroVietnam Transportation Corporation (PVT), PetroVietnam Drilling (PVD), Becamex IJC (IJC), and Da Nang Rubber Corporation (DRC). The southern bourse witnessed a balance in demand and supply with selling pressure easing yesterday. Overall, 155 codes added value, while 82 codes dropped. As more than 145 million shares changed hands, the trading value totalled more than VND2 trillion ($95 million), which was slightly lower than last Friday. With gains registered by speculative stocks, the benchmark indices on the Ha Noi Exchange were seen closing higher yesterday. The HNX-Index added 0.53 per cent to reach 82.24 points, while the HNXFF-Index, composed of stocks with a minimum free-float rate of 5 per cent, closed at 82.22 points, rising by 0.72 per cent. Tracking the top 30 shares, the HNXFF-Index advanced 1.08 per cent to end at 164.82 points. 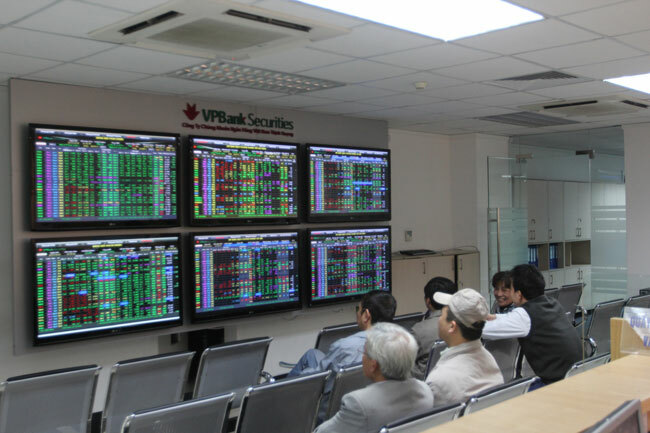 Liquidity on the bourse remained at a high level, as more than 90 million shares changed hands with a total value of VND883.7 billion ($42 million). Stocks of the real estate and construction sector, such as Hoang Anh Gia Lai (HAG), FLC Group (FLC), and Hoang Quan Real Estate Corporation (HQC) posted huge gains yesterday. In addition, many stocks of Song Da's members reached their ceiling prices yesterday.